A couple weekends ago I went to visit my friend Kate in London for a relaxing getaway. While I didn’t really need an excuse to go see her, we planned it around a New Moon Tea Ceremony and it was such an amazing experience. I had never been to a Tea Ceremony before, but Kate highly recommended it after going to a Full Moon Tea Ceremony the month before. She asked if I wanted to go – and of course, I was IN! So I posted a lot about this on my Instagram and I wanted to write a blog posting about it in case you’re interested in going but not sure what to expect. 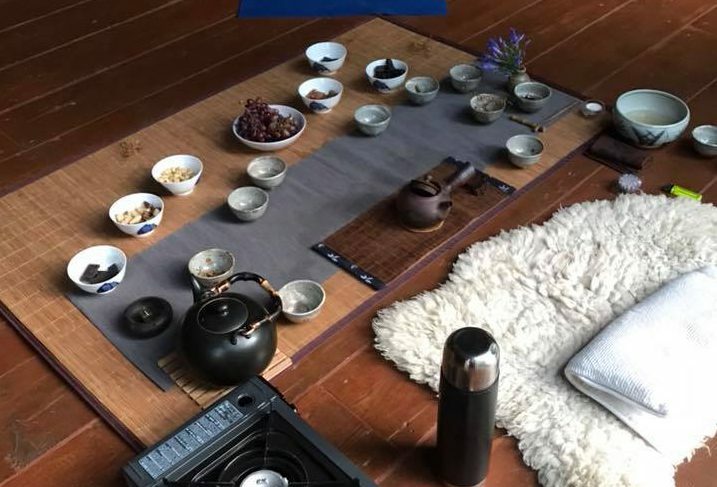 I am sure that all tea ceremonies are different, so of course I cannot guarantee that this is what you’ll experience – but I HIGHLY suggest that you attend one if you find one in your area or an area you happen to be traveling to. So what was this Tea Ceremony like? Introduction: The lady leading the tea ceremony told us about the tea we would be drinking, why she chose it and even let us know that she road her bike uphill nearly 10 km in order to fetch the water from the spring. Mind blowing. Then we went around the room and introduced ourselves, said how we were feeling and what brought us to this tea ceremony. I was feeling really relaxed (which is not really normal for me) and I came to the tea ceremony because I had never been to one before and I wanted to see what it was like. Drinking tea in silence: Then the ritual began, and it was beautiful! She really had such a mesmerizing and methodical way of pouring the tea and we drink 5 rounds of tea in silence. There was no rush, we just drank the tea as fast or as slow as we liked and then put the cup back to be filled for the next round. Energy healing: After we finished drinking the tea, we lied down on our backs for 15-20 minutes and she performed an energy healing on us. I am not sure what this “looked” like because my eyes were closed and we were all in basically Savasana (corps pose). It felt so incredible and I could feel every single muscle in my body completely relaxed. Snacks & sharing circle: When the energy healing was over, we slowly returned back to a seated position only to find a delicious array of snacks: dark chocolate, pecans, brazil nuts, grapes and cashews. We went around the circle again (while simultaneously snacking) and shared what came up for us while drinking the tea and during the energy healing and also shared how we were feeling. This part of the ceremony is what the picture is from, even though I am always taking pictures and sharing everything – I felt like it was appropriate to disconnect and just take one picture at the end and leave the rest of the memories in my mind and heart. Hugs & departure: We shared a bit more conversation, gave lots of hugs and headed on our way. For me it was so interesting how connected I felt to these women even though most of the time we spent together was in silence. It was so powerful for me because taking the time to relax and “just be” has been almost non-existent for me the last years. But now that I have changed my path and have returned to being self-employed, I knew I needed this New Moon and regeneration in order to continue to execute my purpose. All in all, the tea ceremony took around 2 hours but the time really flew by. It’s definitely an experience I will never forget! If you’re ever considering going to a Tea Ceremony – GO FOR IT! And if you’re in London and you want to participate with the same lady as I did, you can find out more information here.